Burns are a frequent occurrence following electrical shock. The severity depends largely on the time and intensity of the electrical shock sustained. Something to remember is that it is the amperes and not just the voltage that make the electrical current more (or less) dangerous, which is why getting shocked from an electric fence is painful but not deadly, whereas an electric socket in your house can be much more dangerous. The burns can vary from superficial burns to the upper layers of the skin and mucous membranes in the mouth, or may damage and kill deeper layers of tissue by leaving large open wounds. The effects of the electric burns may not be seen immediately after the incident and the tissue may even appear normal initially. The cells that are damaged first swell and then die off. This process can take hours to days, depending on the intensity of the electrical shock. The hair and whiskers around the affected area may also be singed. Some electrical shocks can produce enough energy to fracture teeth. Electric shock can affect your pet’s heart immediately, during and after the shock. During the shock the heart may go into fibrillation (an excessively rapid heart rate where very little blood is actually pumped by the heart) and asystole (where the heart starts beating erratically and then stops beating). Both of these may result in death. Following the electrocution your pet’s heart may demonstrate other cardiac (heart) arrhythmias which need to be monitored by your vet. The next complication to discuss is the negative effect on the respiratory system. Swelling over the mouth and throat regions, spasm of the diaphragm (the main muscle for breathing in the chest) and pulmonary oedema (fluid on the lungs), are all potential complications of electric shock. During the shock breathing may stop, but generally once they are separated from the source of electricity they do start breathing on their own again. Clinical signs that the respiratory system may be affected include rapid harsh breathing, blue gums, coughing, or absence of breathing all together. The swelling is caused by direct injury to the tissue of the mouth. The fluid on the lungs is actually secondary to damage to the nervous system from the electrical shock which then causes changes in blood pressure and heart function with a build-up of pressure in the blood vessels of the lungs and leakage of fluid out of the vessels into the tissue of the lung. Within 24 to 48 hours this already starts resolving on its own and veterinary care is necessary until breathing stabilises. The nervous system (brain, spinal cord and nerves) can be over stimulated and injured during an electric shock. This can lead to muscle tremors, seizures, limb rigidity and even death. When bringing your pet to the vet inform us immediately that your animal has undergone electric shock, as this will guide further diagnostics and treatment. This allows the vet to work more efficiently. Some diagnostic that the vet will carry out may include an ECG (monitoring the electrical activity of the heart for arrhythmias), radiographs (X rays) especially of the chest to evaluate the lungs, and blood tests to assess the overall wellness of the patient’s body and its functions. Treatment of shock varies largely depending on the presentation of your pet. If they are in shock this will be treated aggressively with drip placement and monitoring of heart and blood pressure parameters. Fluid therapy is used to maintain and stabilise blood pressure and is very carefully used so as not to overload the system and worsen any fluid on the lungs that may be present. If the pet is presented in respiratory distress (breathing difficulty), the reason must be determined quickly and a source of oxygen supplied immediately. If there is excessive swelling around the face and neck then a tracheostomy (a hole directly into the trachea) may be performed and air supplied through the hole until the swelling can be treated. With fluid on the lungs, oxygen is supplied and medication can be given to promote the drainage of fluid away from the lungs and dilation of the airways. The first 24 hours are always the most critical. In very severe cases they may even have to be placed on ventilator to ensure adequate oxygen supply to the tissues. Any burn wounds are treated conservatively with cleaning and topical treatment. Antibiotics may be necessary if there is any concern for infection. A very important aspect of any treatment is pain control. As far as we can tell, animals feel pain as much as humans do and we need to provide relief with oral or injectable painkillers. Once the tissue has healed enough to ensure good surgical success any major wounds can then be operated on without the risk of many complications. This may take a number of days as the damaged tissue may slough, so do not be too impatient. Premature surgery may lead to a wound pulling apart (dehiscence) which will then require further surgery and discomfort for the animal. 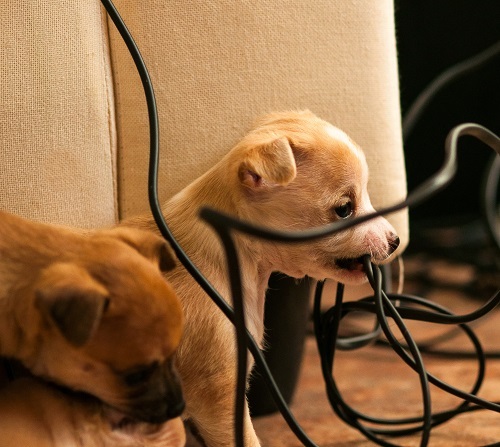 Try to keep all electrical wires well covered and unexposed, especially around young pets. In the event the worst happens bring your pet to the vet immediately.